Alembic Club: Sonicus Projects , Current And Past. Here is a pic of my coffee house gig on 9/26/15 . I was playing 73-32 here. 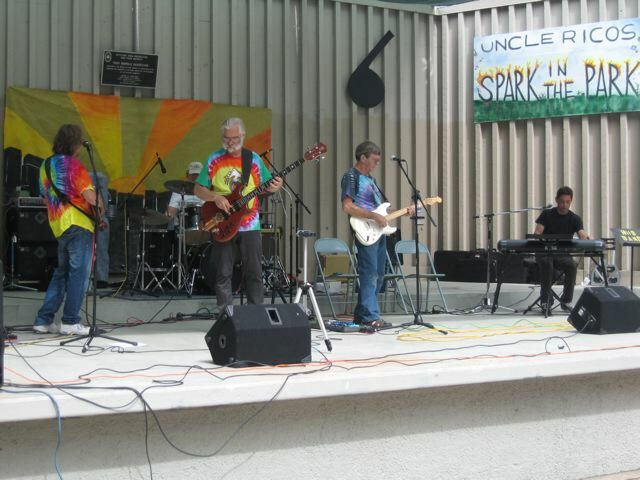 Here are some views of my 9/27/15 Festival Gig. It was a very worthwhile benefit for the Hayward Ca. Public School Music Education System. I was playing 81-1940 here " Stereo". 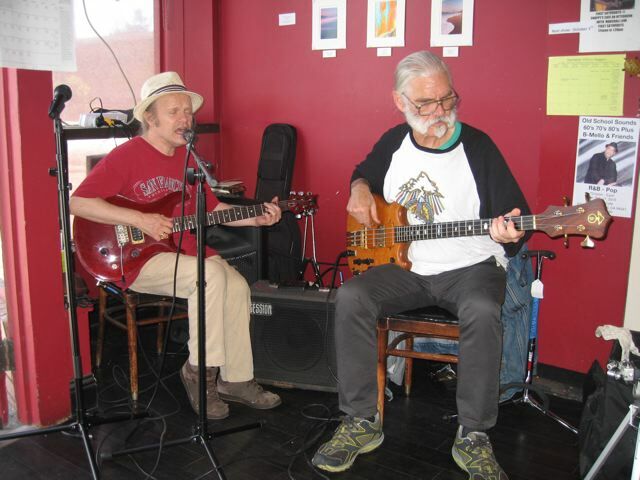 I am playing in the band " Easy Wind" The lead Guitarist plays an Alembic Further as well . Hello Friends here is the poster art for our next " EASY WIND" Gig. A rehearsal in a venue with high ceilings. It is the "Central Stage" in Richmond , Ca. It is good sounding room . 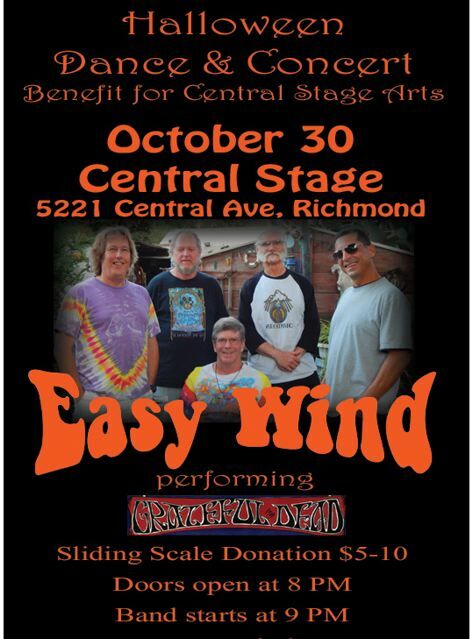 My band " EASY WIND" will be playing at " CENTRAL STAGE". Tomorrow night 10/30/15 . Doors open at 8PM . Here is a vid from my last gig on 10/30/15. I am playing my Series I Standard Point / medium scale # 81-1940 . I have named this bass Hrista after the Norse Valkyrie . Related to Old Norse Hrista (meaning "shake, quake") and therefore meaning "the quaking one". Here is the Youtube vid to my Gig with " Easy Wind" at a private party that we played at for the " Alameda Yacht Club" . It was an intimate setting. I am playing my Series I Standard Point # 81-1940 again. The lead players Alembic Further and my Series I Bass shine bright in this vid. We are getting better at our segues from tune to tune. I think that we are making progress. Sounds nice, Wolf, your bass sounds very solid, nice tone! 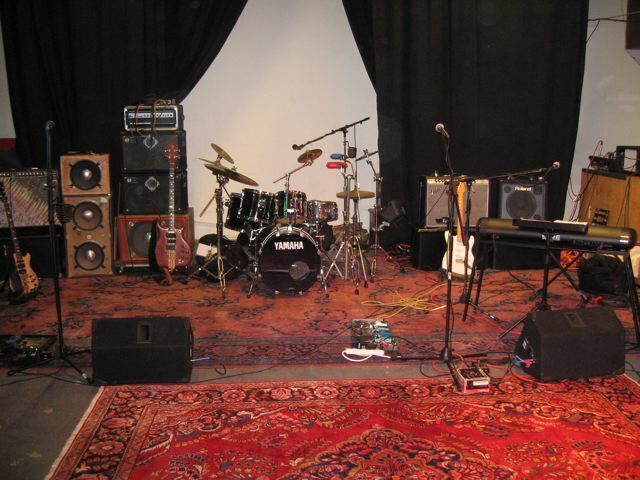 When we showed up for the gig, we all immediately realized how important dynamics would be in their party room. They liked us and promised to get us back for another event. The bass that I am playing does indeed have a distinctive voice all of her own. I think I named her well ! "I think that we are making progress." Agreed; this is the best recording yet. Dave, Thanks! It is indeed a long recording with our various segues. We are adding more material each week and trying to improve what we are already playing. The extended " Eyes of the World" jam with the added changes and the riff is also fun but not in this recording. I will post that when we perform that changed version at a gig. Here is an example of that from a Dead show from 11/11/73 @ " The Winterland Arena" I like this show, I actually think I was at this one . I was 17 years old at the time just hanging out and listening, and thinking WOW !
" 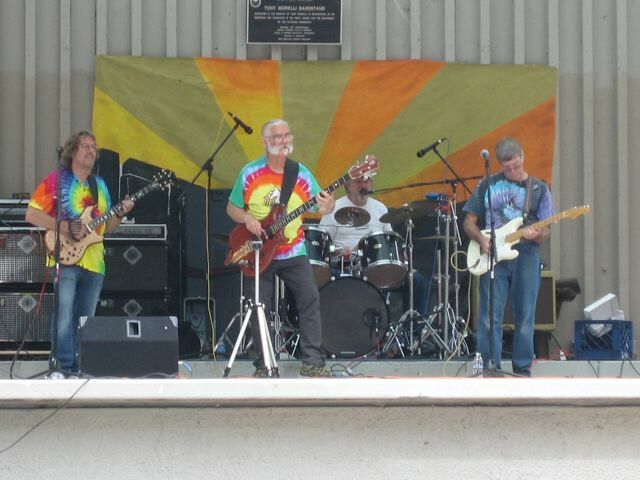 Easy Wind" will have some gigs in early 2016 and we are currently scheduling our performance calendar . We will post them on our website and I will mention them here as well . We are also compiling our own original material and adding and working on expanding our collective musical influences into our sound . We are making weekly expansions and refinements. Wolf, regarding the Alameda Yacht Club gig... that's some mighty fine music you guys played - Well Done! I forwarded the link to some guys I've been gigging with I think might enjoy it too. P/S, is that "Woody" on lead guitar? Thanks so much for taking a look at our Vids and thanks for the compliment. The lead guitarist is Ken Younger and the Alembic Further that he is playing is his own and not " Woody", owned by "lbpesq /Bill,tgo". You're so right about the (importance of) segue between tunes. Sometimes the most accomplished performer(s) is/are hindered by inability to entertain... it's a different skill set altogether. The band I'm currently in suffers from exactly that condition - the music is fine, even darn good some days. I am actively trying to improve as a frontman, talking *to* the audience rather than just introducing the next tune. It's not natural to me... much harder than playing bass for sure. EASY WIND Plays Again ! GIG ANNOUNCEMENT ! 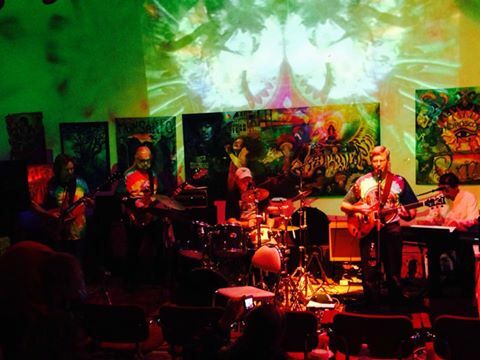 Psychedelic Light Show by Liquid Sircus Delights( LSD VISUALS) Far Out! $10-$20 Donation. (or as much as possible) PLEASE SUPPORT THE ARTS! Sonic Regards & A Happy New Year ! Here is the facebook link to my Easy Wind Valentines Party gig . Please share and repost . This is really a nice venue that does quite a bit of local Art Promotion , a very worthy cause in my opinion . Hi friends ! __ GIG UPDATE ! 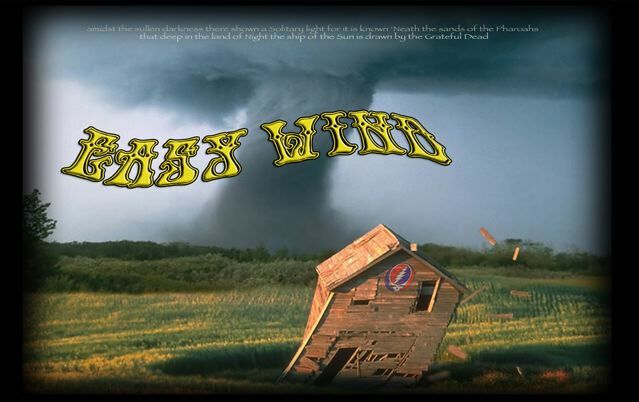 I have a GIG with " Easy Wind " tomorrow 2/13/16 as posted above in my posts 4700 & 4701. It looks like we are going to have a good turnout ! There will be food there too. A light show as well ! We are going to play three sets filled with " Early Grateful Dead" material. _____Think 1968 ! We look forward to presenting " Cryptical Envelopment > The Other One /The Golden Road to Unlimited Devotion /Viola Lee Blues/ and much other " Early Dead" material. I hope too see there . Here is a pic of the stage with us and the light show. The gig went well . There may be a Youtube vid posted of it as well in a few days or so . Very cool, Wolf, looks like you guys are having some fun! Thanks Rob, Yes , we actually had a decent turnout of folks considering there were other local events occurring simultaneously. We have more gigs coming up ! I will post them here soon . Is that your single pickup Distillate, or #32? The stage area is rather shallow there and I was directly in front of a scaled down rig , so I opted for the single pickup Distillate this time. A simple approach this time for this gig . Here is a video of a tune called "The Golden Road (To Unlimited Devotion)" . It is from my gig last week with my band " Easy Wind". The light show is blazing behind us ! An early " Viola Lee Blues"
About a 1966 version perhaps. The light show is really cool in this one ! Rob, thanks for checking it out ! I love that stuff. When they played Cream Puff War, Born Cross-eyed, and What's Become of the Baby in Santa Clara on 6/27/2015 I was in heaven! Apparently they got a nod from those observing from afar with the rainbow as well. Come and join the part every day! Come and join the party every day! For that last gig the owner of the venue requested a 1968 theme in part for his " Valentines Day Party" . He is a photo journalist/ published photographer from that era who is now in his 70's . We had fun picking a set of Grateful Dead and other cover material from that era. I really love the " Dead" from the early years as well . Great videos; and the '68 theme for a Valentines party is a cool idea. 2/14/68, my 7th birthday, would be a fun show to cover! Thanks Dave! It was fun . 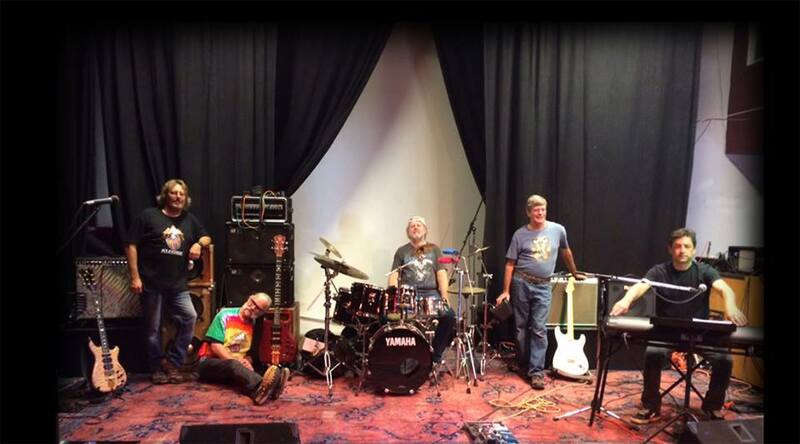 We are already working on tunes in "Easy Wind" for the next gig at " The Bistro" in Hayward , CA. on 4/2/16. I might have other gigs with other folks in-between that I will post as well . Hi Edwin , thanks for that link . I will give it a listen ! P.S. Happy belated birthday my brother , we are one month apart. My # 60 will be on 3/14/16 . Strangely , Mr. Philip Lesh has his birthday on 3/15 , along with trumpet master Mr. Harry James! Both guys are influences on my approach to music . it must be a fish thing , LOL !
" The Art House on 2/13/16"
Here is a 1967 version of " New , New Minglewood Blues"
Here is "That's What Love Will Make You Do" JGB Style. We do a surprise segue into a previouly requested tune. Here is from what I have been told from folks that were there , a decent "Playing In The Band". 9 PM ___ NO cover charge ! 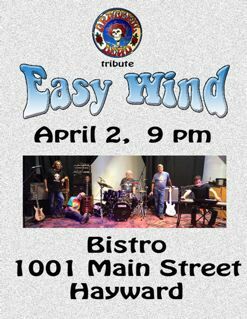 Tomorrow night , my band " Easy Wind" will be playing at " The Bistro" in Hayward , CA. as posted above. We had a great rehearsal last night with our keyboard player Michael playing his portable two tiered Hammond B-3 organ . he will be playing that our gig as well . he really knows how to make that instrument shine ! We will be doing several old Dead tunes from the Early Years.
" Cryptical Envelopment> The Other One " seems to keep getting better. We will also play " Let It Grow " , Viola lee Blues , New New Minglewood Blues and lots of others . We play from 9PM to Midnight . It is a free show with NO cover charge ! There will be more gigs coming up INCLUDING our booked performance at the Shakedown Street Festival 2016 on Sunday, September 18th in Berkeley , California . I hope to see some of you there and tomorrow as well . Hope your gig went well. My wife and I were planning to come by until our plumbing backed up around 9PM that night. We ended up stuck at home waiting for Roto Rooter. It was almost midnight by the time they had finished snaking out the sewer line. Stephen , It is nice to hear from you . I know how those plumbing emergencies are . Been there done that ! All changes are in 8 bar phrases except D# riff 4 bars and the Dm ending 2 bars . We also did "Let It Grow" and took that one "out side" and jammed on it as well . It all went over well and was fun and made the listeners happy , and that is important to me .